HAVE you seen the video footage of Gordon Brown on the spanking new Downing Street website? The site will feature exclusive video coverage of the prime minister’s speechezzzzzzz, press conferencezzzzzz, media appearancezzzzzzzzz and a newzzzzzzzz of Gordon’s thoughtzzzz and choices of jacketzzz and Comfi-slacks. 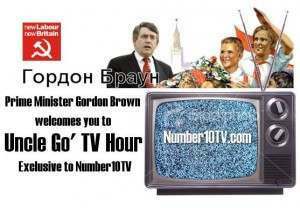 It’s called No.10 TV. And Anorak went to pay it a visit. Knock. Knock. A new era in political communication is born as Uncle Go’ welcomes you to Downing Street’s all new television channel Number10TV, which will connect your front room directly to the very heart of power. Watch PM Brown as he dithers over the most pressing issues of the day! Relish this unique opportunity to see the Prime Minister blame anyone but himself for keeping interest rates (with his inflation targets) so low for so long, creating the very credit bubble that has now exploded! Delight in watching the PM plot his way to hang onto power until 2010 when it will be too late for the British people to get their promised referendum on the EU Treaty, and therefore ensure himself and his cronies will secure highly-paid jobs in the EU. All this and more, coming soon direct from Number10TV!